HPE'S JANUARY, 2018 CREW OF THE MONTH! Team HPE was honored to launch a brand-new Crew of the Month program at our recent All Hands meetings – and recognize our very first Crew of the Month for January, 2018 – the HUB RiNo District team! HPE's new Crew of the Month program recognizes one high-performing project team across divisions, each month, for their outstanding safety, teamwork, attendance, schedule, client satisfaction, and financial performance. 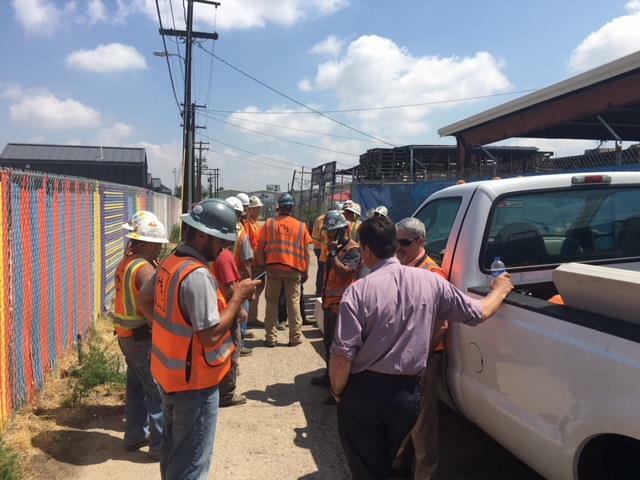 HUB RiNo District team members include: Brooks Williams, Shaun Anderson, Ryan Niko (Plumbing Field Supervisor), Tom Marquardt (Sheet Metal Field Supervisor), Ryan Niko Jr., Joe Vasquez, Carlos Valles, William Moses, Matt Hammer, Joes Morales, Henry Ashton, Matt Harrell. From the pre-task planning, the three-week look ahead schedule, managing the man-loaded schedule and supporting the productivity analysis, Niko and this crew led the change to success at HUB RiNo! This crew has also been recognized by Mortenson Construction (GC) as their Crew of the Month and twice as Crew of the Week, and Niko has also been recognized for his pre-task planning efforts. A huge kudos to the HUB RiNo team for a job well done!